Who is OZ NOY? And why should YOU listen to him? Cyndi Lauper, Nile Rogers, Gov’t Mule, Richard Bona, Chris Botti, Gavin DeGraw, Phoebe Snow, Roger Clover, Clay Aiken or Toni Braxton, as well as repeated Guitar Player Magazine Poll winnings. => Make sure you also check out the SECOND video further down on this page to see how much of a MONSTER Oz is as a PLAYER!! * Jam-packed 2.5 hour Lesson incl. PDFs/TABS & MP3 PLAY-ALONGS with his Killer Band! In this jam-packed 2.5h Guitar Improvisation Video Lesson (plus 50-min Interview! ), Oz shares his unique approach to Improvisation – unrelated to any specific style of music – and breaks it all down for you: from improvising over one chord to the blues and beyond. Oz Noy, and the price of admission, this is stealing from the gold mine. => VIDEO and MP3 PLAY-ALONGS with his killer band (James Genus & Rocky Bryant) plus PDFs and TABS included! * PDF Chart and TABS for each Guitar Improvisation Exercise! “IF YOU ARE SERIOUS ABOUT GETTING BETTER, GET IT. NOW! Absolutely one of the very best guitar instructional packages I have ever seen. 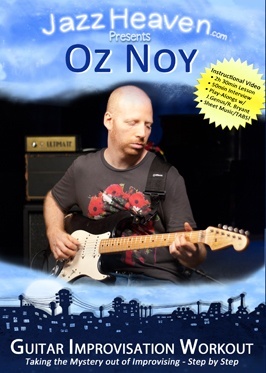 Built around Oz's approach to improvising over dominant chords, you will get all of the tools you will need to improvise over any style. The material ranges from scales to triads to arpeggios and other patterns and features Oz demonstrating the concept alone and with a band. The DVD is beautifully shot and the sound and camera work are crisp and clear. It is amazing to get to see THAT much great guitar playing from that close! I have a small library of instructional material and I would consider this company as good or better than anything I have ever seen over the past 20 years of playing. The main guy, Falk Willis, is a musician and you can tell he is really trying to create a product for musicians to REALLY use. Really well done instructional material. * Learn 4 of Oz' Best Songs. Step by Step! And get to play with his Killer Band! “I just got the two Oz Noy DVDs! These are by far the best instructional videos I've ever seen!! I wish I had had these DVDs 15 years ago!! You've done some great work! => You will receive the Play-along versions as a VIDEO version and Audio-only MP3! PDFs incl. TABS for all 4 songs included! Plus, as a BONUS: transcription of Oz' solo on “Twice in a while”! * PDF Chart and TABS for each Song! 24-Hour Access STARTS when You purchase! “I really love your DVDs. They’re awesome quality! I bought many Instructional Videos but this is the best I’ve ever seen. 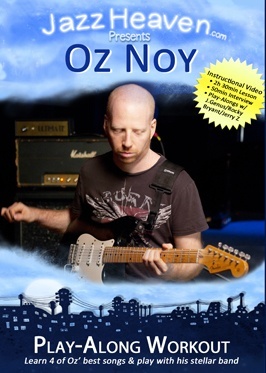 I've seen Oz live and was always wondering how he did things – now it's possible to understand, with these DVDs!